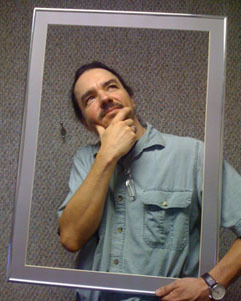 Lonnie Richardson has worked for SDB Creative Group for several years as the Director of Video and Audio Production. His many years in the industry has given him insight into how to make great video production that will deliver the clients message and meet their goals. Lonnie’s work has earned him many accolades but recently he received the Best in Broadcast and Gold Addys for his work with Fitness Specialist and another Addy for his work with the Midland Chamber of commerce. We encourage you to check out the links below to see his work. So, from the man himself, Lonnie gives us some insight on what inspired him to work in the creative field of commercial production. One of the advantages of growing up in a small west Texas town, is the complete lack of entertainment. Of course, you don’t see it this way when you’re doing the growing up. But the absence of movie theaters, bowling alleys, and shopping malls, forces the young mind to develop its own form of entertainment. I credit much of my creativity to this upbringing of boredom. Now a days, 300 cable channel TV, video games, and the internet, have flooded ample entertainment into every corner of our lives. You can’t even hide from it in a small west Texas town anymore. While the times have changed, the usefulness of a creative mind has not. Now I use that creativity not just to cut through boredom and entertain myself, but to cut through the overwhelming clutter of media and deliver a message that stands out. Yesterday’s play is now today’s work. Lately, there’s been a lot of focus on ‘social media’. Businesses are clamoring to create Facebook and Twitter pages and get their messages out to the masses. While we agree that social media is important, the question you should be asking yourself is, “Is social media important for my business?’ Just like people, all businesses are different. The medium with which you spread your message will be different, too. With the rise of social media, ‘traditional media’ has emerged as the go-to name for mediums like radio, television, newspaper, billboard; those mediums that up until about 3 years ago (more or less in different parts of the world) drove the advertising world. While digital/internet advertising has grown, it’s easy to forget that traditional media still helps drive prospective customers to your product or service. People are still watching television. Radios still come standard in all vehicles. Newspapers (whether printed or online) are still being read. You are still seeing billboards on your commute to work. The key to traditional media, in this digital and social world, is knowing your customer, knowing their lifestyles, knowing their buying habits. Once you’ve figured that out, you’re one step closer to knowing where they will see your message. How do you learn about your customer? ASK THEM QUESTIONS! Why wouldn’t you want to know where your customers come from? Why wouldn’t you want to know their radio-listening or TV-watching habits? I’ve walked into plenty of stores and been asked, ‘How did you hear about us?’ They are doing their research. If they have put money into radio and nobody mentions radio, then why would they continue to use it? Doing simple research can help you determine, to a better extent, where to focus your advertising budget. So, you’ve figured out who your customer is and how they respond to certain traditional advertising means. Now, should you use social media? When thinking about social media, most business owners think that it’s just something to do. Something that isn’t that important. Something that can be done as an afterthought. This is dangerous. Allowing interns or ‘the girl at the front desk’ to manage your social media presence could be worse than having any social media presence at all. Unlike traditional, social is constant. It’s a 24/7 message about your company. You don’t let interns handle your business, you shouldn’t allow them to handle social media. Social media is important to your brand and it should be handled as such. What can social do for your company? Social media offers an alternate outlet to promote your message. By coupling social with your traditional campaign, you’re amplifying that message, which can only help. In addition, because social IS social, there are more opportunities for your business to be shared, liked or talked about. Who wouldn’t want that? Does my business need to be social? If you’re a retail store or restaurant, your answer is already YES. If you’re not on social, you’re behind. But, if you’re a sign company, you may not have a huge audience to begin with, so investing time in social, may not be the best use of resources. Do I have the time to commit to social media? Social isn’t to be taken lightly. If you’re going to have a presence, it can’t be an afterthought. It must be done and done consistently. Will I be consistent – posting daily or at least 3-4 times per week? If you’re jumping on social, you must be SOCIAL. If you post consistently for days, weeks, months and then get busy and leave your page silent for days, weeks, months, you’ve lost any momentum that you had gained. Social is quick, instant and constant. People are online at all times of the day, sometimes all day. In order to be seen and remembered, you must stay active. Can I handle being engaging – answering questions or complaints? Again, because it’s the nature of the beast, social gives consumers the outlet to engage with businesses like never before. They ask questions – Do you have this in stock? What colors does ABC come i? How much is it? They also post praise and complaints. Are you ready to deal with this? Once you’ve answered those questions, you’re ready to at least dip your toe in the water. Considering there are more than 800 million people on Facebook, we’d say that either way, having some kind of social presence can’t hurt. Need some help? SDB Creative Group is a full-service marketing firm offering complete traditional, digital and social solutions for businesses of all sizes. Give us a call to set up a consultation – 432.218.6736 or email us at info@sdbcreativegroup.com. Our Director of Social Media, Danita Maldonado, has been busy checking out the new Google social network, Google+. She blogged about it and would love for you to check it out. If you’d like for her to send you a Google+ invite, email her at danitalicious@gmail.com. Our marketing must (#6) this week is Public Relations. What is public relations? It can include press releases, getting articles written for or about you. It can be events, such as trade shows, parties or benefits for your clients. It also includes networking with trade associations and community groups – Chambers of Commerce, Rotary, Toastmasters, etc. Most companies do not have a public relations effort, but it’s not hard to put together a highly effective, cohesive one. It can work miracles for building your brand and fame, especially with the prominence of the internet. One story on the news or article in the paper can propel your name forward overnight, compared to a regular advertising campaign that takes several months to mature. Some statistics show that over 80% of news is placed. Think about how many real news days there are in west Texas. Not many. Take advantage of this by helping the reporters do their job, and at the same time build your brand. “If you don’t invite people to come into your business, they won’t,” Sam Walton. This quote says it all. You have to advertise to stay ahead. Unfortunately most businesses have no clue where they can most effectively advertise. Take away this nugget: Media reps lie. They all want your dollar, and they are all number one. Their main interest is in selling their time or space whether it is a good fit for your business or not. When you combine these tactics with a company’s lack of time to fully investigate where the best place to advertise for them is, you have a recipe for failure. What does this do? It leaves a bad taste in the advertiser’s mouth, and leads them to make an even worse decision not to advertise. Want to know how you get around the media reps and put everything in black and white? How about knowing how to hit 100% of your target by spending less money? Send us an email detailing what your biggest marketing and advertising challenge is, and I’ll let you in on these secrets.